Easy, quick, delicious, impressive - everything you want out of a dinner party recipe. This is the perfect side dish to get your guests asking, "how did you do that?" 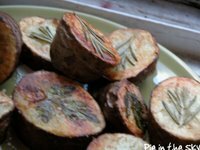 I used to make oven-baked tri-color herbed potatoes all the time, but I have a feeling that now, I'll be making these instead - they were such a success! Great flavor, tender inside with a crispy crust, and a pretty herb tottooed on top that reminds your of flowers you pressed in books as a kid. Pour 1/2 cup olive oil into a 9x13 glass baking dish. Add salt and papper and swirl to combine. Rinse potatoes and pat dry. slice each potato into 1-inch thick rounds. Press a rosemary sprig or a parsley leaf on one side of each slice (the cut side of the ends) and place herb-side-down into the oil. Drizzle remaining 2 tablespoons oil over potatoes and sprinkle with salt. 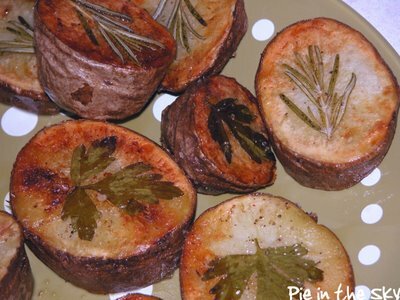 Bake until potatoes are soft and nicely browned, about 40-45 minutes. Shift potoes in pan every ten minutes to prevent sticking. When done, remove from the pan and turn herb-side up. Enjoy! Thank you Kate! We are grilling for Father's Day and needed a good potato recipe! found out our new stove is both much larger and still gas...that means we're now in the market for a wok! Beautiful - and so creative! Bravo, Kate! jahnna - sweet! wok time! gas stove = completely necessary, regardless...yay! I must say those ARE very impressive looking there kate! Yum! These potatoes look so outrageous. I LOVE it! 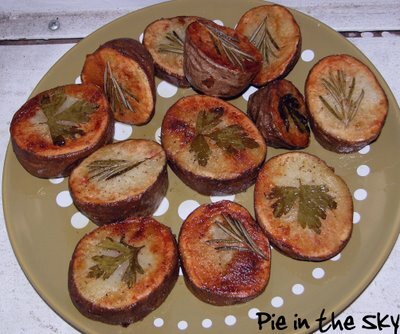 Your potatoes are amazing, they look like little individual stamps. I bet they tasted awesome too. Hi, just came across your blog and its great. 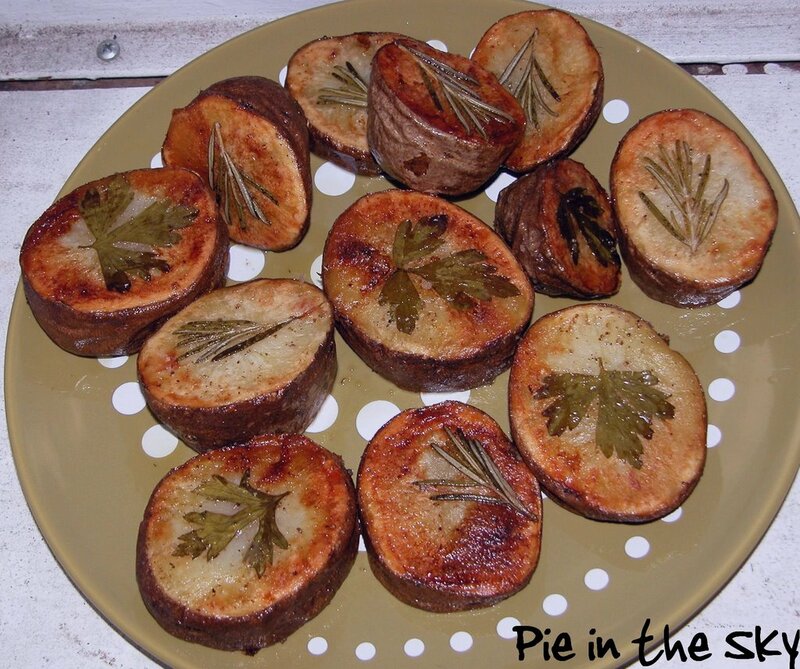 I really like these cameo potatoes... so clever! "I am going to make a peanut butter sandwich."